You all know I am a typical software professional. Today I was trying my hand to control my farm's grazing cow and holding camera in my hand to suit the calf and cow grazing the lush green vegetables bed. As usual, the calf was jumping here and there and his mother was trying to locate him and she couldn't keep patience and went out of control. I as usual was keeping the camera on to capture the natural picture of cow and calf jumping around and see what happens. Sorry, I am not a good camera man. Enjoy the novice camera man video and sorry if you are getting irritated. This is perhaps the youngest farmer of the world, irrigating his vegetable fields. Here is the latest update of Rameshwari Natural Farm. In this video, I also show cow and newly born calf. 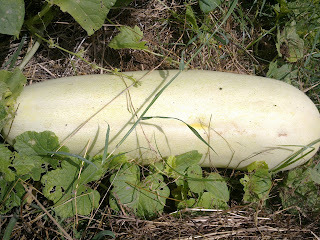 Apart from this I am also comparing the length and diameter of the biggest cucumber I have seen till now. 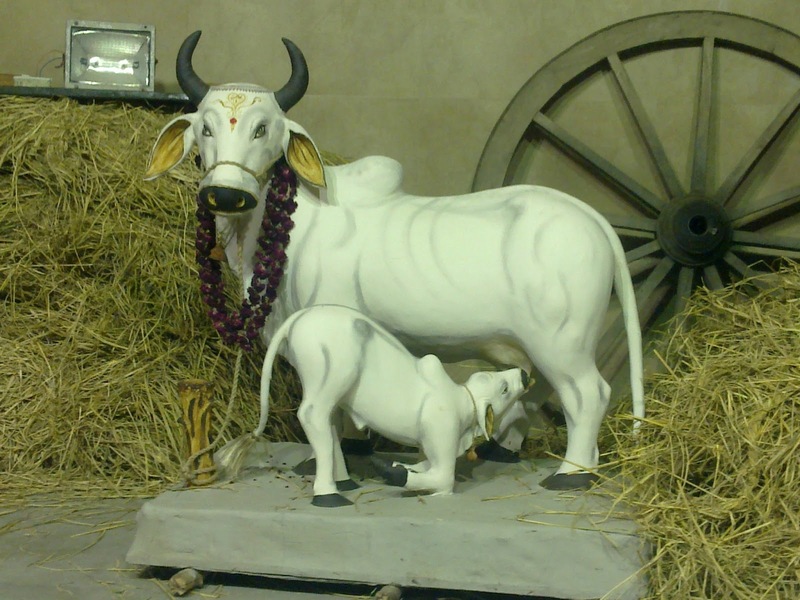 Below picture is of our cow and newly born calf. I am trying to feed milk to the calf. Newly born calf, less than 24 hours old. Video, showing the current status on what we are doing. People says, a picture tells more than a thousand words, so I am not explaining about our cucumber here. Below are two pictures of the same cucumber, try to compare its size and weight by its nearby leaves. 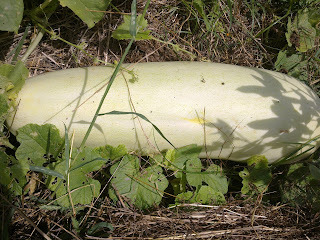 Many farmers around my village have not seen such a large cucumber till now it their life. Feedback and comments are more than welcome. I am happy to share this. 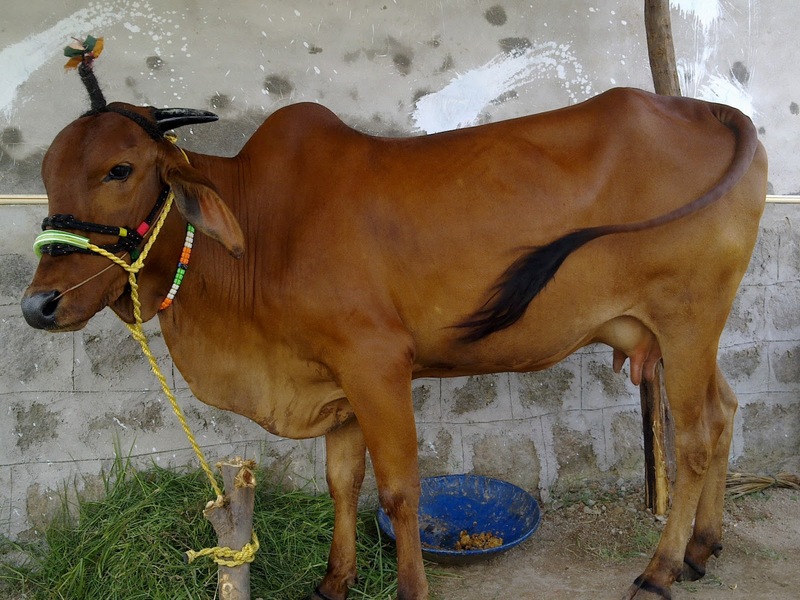 We have bought a cow today from Sankarpally cow fair. 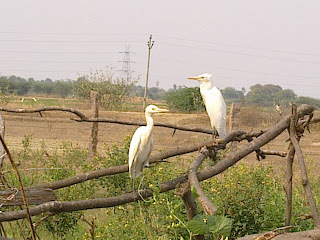 They said, this species origin is from Maharastra and its name is Deoni. 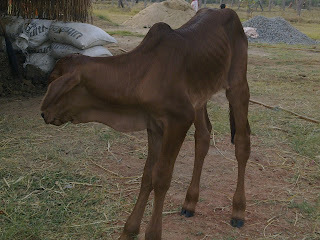 She is expecting calf in another 2 weeks or so as said by its ex-owner but I feel it may take 1 month at least. Its not very small not very big in size. Medium built but looks beautiful. Today, I lived my mothers dream, she always wanted to keep cow in our home and she did too but not too long. 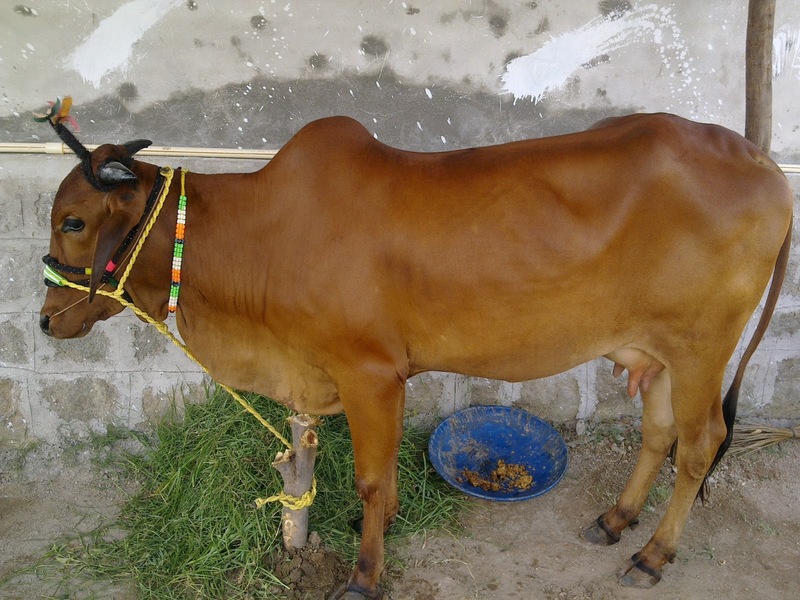 After buying this cow, I was missing my mom a lot. Hope wherever she is, must be feeling proud and happy about me. The plan is to start collecting cow dung and urine to prepare Jivamrita and other useful mixture for betterment of soil and plants. I am surprised to see a cucumber today. Its weight is more than 3 kg, length is more than 1 feet. It goes without saying that it is the product of natural farming where we have not used any external input in the form of fertilizer and pesticide. We have only used cow dung. Below is the video that shows the cucumber, red gram, and normal farm update. The seed I had used was bought from a seminar in Nampally last year and it was native variety seed. Do watch the video and let me know your comment or suggestions. 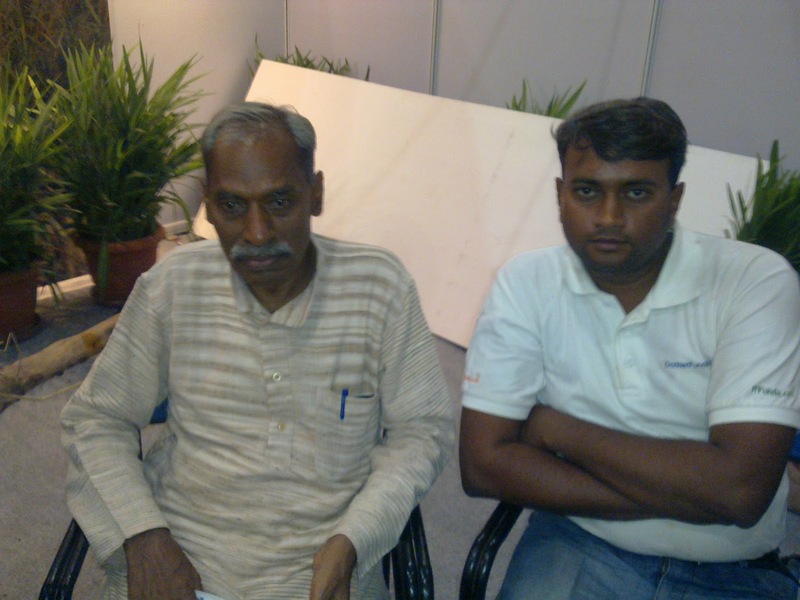 I had an opportunity to attend two days workshop on cow based Zero Budget Spiritual Farming by Mr. Subhash Palekar. I must say it was worth my time and effort. Very impressive and scientific. In my 15 years of professional life, I have attended hundreds of meetings/workshops with notepad and pen in my hand but hardly had filled even one page of the notepad till the end of the meeting. But in this workshop, I wrote almost 18 pages of useful information. You can imagine how useful I found this workshop. I also got opportunity to meet with like minded people and share information. In coming day, I am planning to share the knowledge I have gained during this workshop. I am also going to implement them in my farm this year. I think you all might be knowing the inventor of Zero Budget Natural Farming, Mr. Subhash Palekar. I had an opportunity to meet with him today and spent almost an hour discussing several stuffs with him. He was so kind to give enough time and talk with me. We shared several stuffs with each other and it was nice time. I am going to attend two days workshop here in Hyderabad starting from 27-Apr-2013. Take care and hoping to bring him to my farm some day. This is the first time I have seen this big Cucumber, click on the picture below. I had sowed cucumber seeds few weeks before (6-7 weeks) after preparing trench and have applied Cow dung manure (Jivamrita) 3-4 times. See videos here where I have shown the trenches. 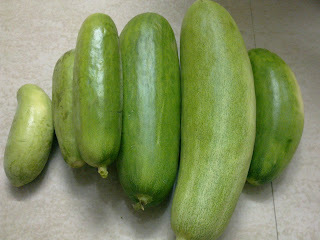 The Cucumber I have got today is almost 1 feet long and weight about 1kg. 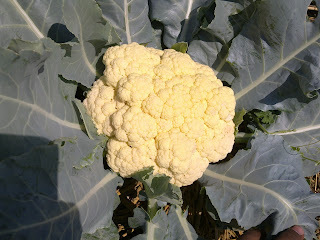 It goes without saying that I have not spread any other fertilizer or pesticide on this. Compare the bigger one in comparison with others. Even if its so big, it is still fresh and tasty. The seeds I had got was from the Agri mela (pure Indian and local seeds) organized last year in Nampally, Hyderabad. Sorry for not updating about the farm for last couple of months. 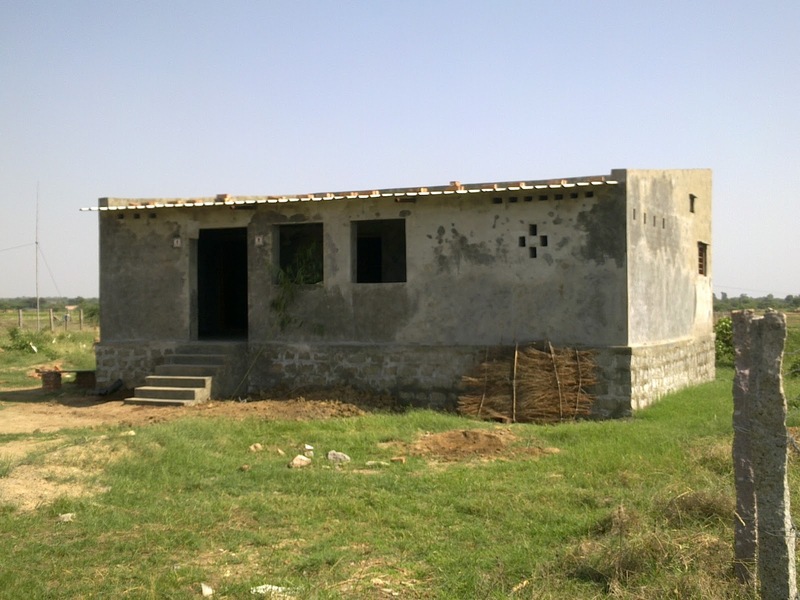 I was quite stuck with Farm house construction and slowly coming out of it. Watch this video and know what's going on currently. We were getting vegetables since last 4 months from our farm for house consumption, except Potato and Onions. You can see the Output page to know what kind of vegetables we were getting. It goes without saying that the taste, quality and feel was much better than market vegetables. Few weeks before I had planted Cucumber and we had got 2 nos. till now. Surprisingly even the last portion of those cucumber were not bitter, all were eatable and sweet. 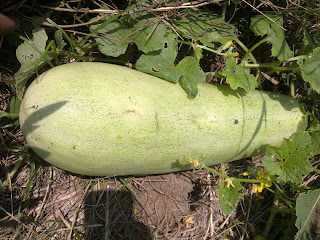 As we have got very good rain for two days few weeks before so again my farm is looking green covered with grasses and old Bitter gourd plants have become green and yielding. 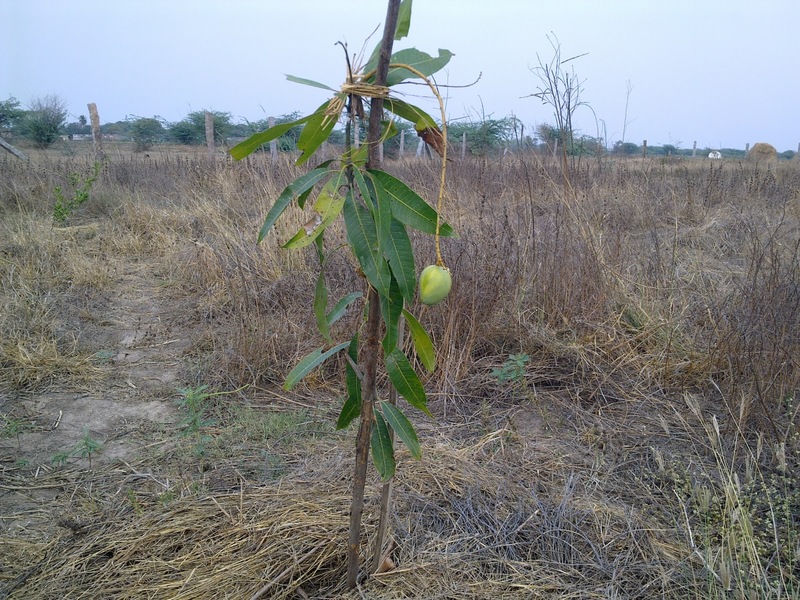 We have also got 2nd harvest from the same Red Gram plants we had sowed in last rainy season. As per Raju Titus uncle suggestion, we had not cut the Red Gram plants during our first harvest. We had just plucked the grains and left the plants as it is. We irrigated them few time and they started flowing and bearing grains. You can see them in the video above. 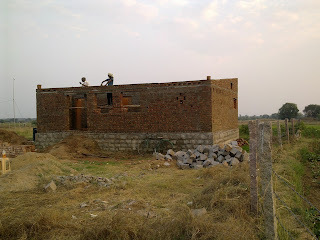 For last couple of months, I struggled a lot during construction of the Farm, you can read a bit about it in that post. Was depressed and went into Negative mode however the love of greenery and my commitment to do something good for the society brought me back and I am good to go. Thanks for reading and sorry for some straight words, negative words if any. If you have any suggestions, comments or want to help me, let me know. Apart from the house construction, something more is going on in my farm. Some greenery is growing slowly and that is why we are getting some birds are flying in to our farm. 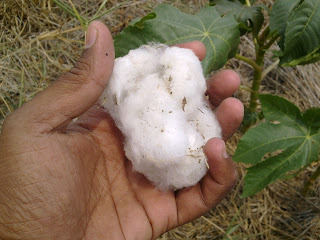 Below is cotton we have got from the two small plants that we had not sown. Perhaps its a God gift. One small mango in a small mango plant. With the help of my caretaker's Ox, we prepared Jivamrita today. 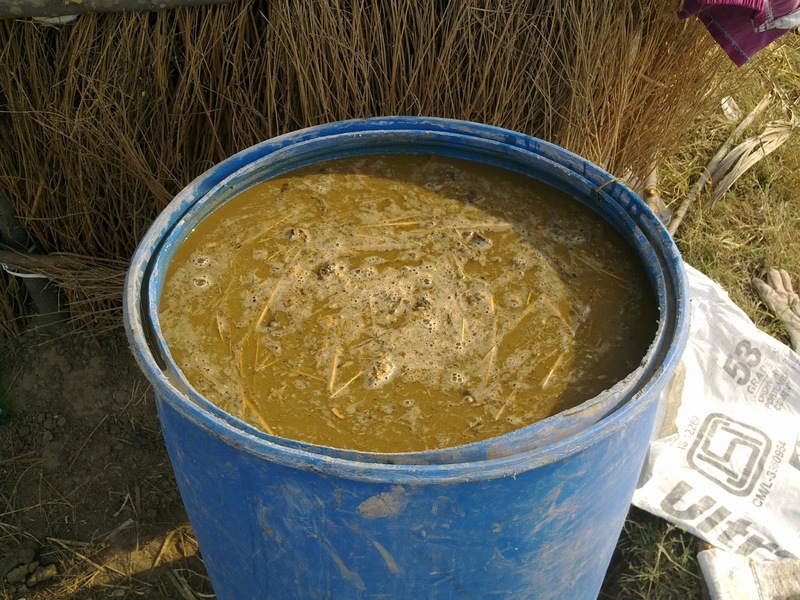 We need to keep this for fermentation for at least 48 hours (mix it well left to right round 6-7 times) and this natural soil improvement solution is ready to use. We are going to use this for our vegetable beds and fruits trees. I am excited, I have already seen the result of Cow/Ox dung compost (just creating heap and leaving for several months, its awesome). As you all know my farm is natural farm so I have not used any kind of chemical fertilizer or chemical pesticide till now and I am not going to use in future. I have not even tilled/ploughed/cultivated the field till now. Tilling decreases the quality of soil but grasses are a challenge for me, thinking of some measure to overcome tilling, lets see how it goes. Since last two days, we have faced 2 snakes. 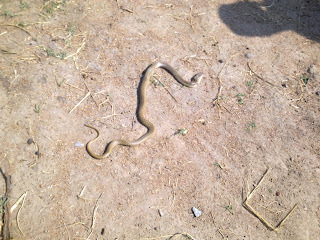 Its not like we have not seen snakes so farm in our farm but they were escaped outside. This time (19-Feb-2013), below snake that looks red in color just crossed by me and my care taker followed it and killed. He said, it was Cobra (Naag). 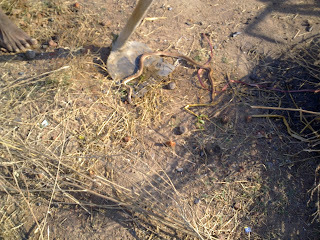 On 20-Feb-2013, we got another snake nearby my house construction that was hidden under the asbestos sheet. When they tried to pull the sheet up, it appears. This one was of soil color and bigger than yesterday's snake. I can clearly see a mark on its forehead (This was Cobra or Naag in Hindi). I am fearful these days. 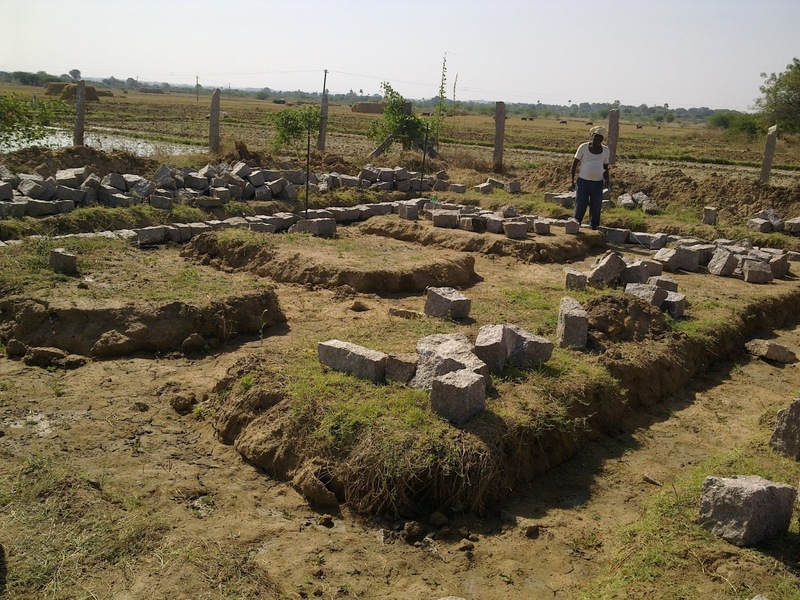 We had noticed a snake few months before whose length was almost 5-6 feet and went into the construction materials (Stone bricks) after that we do not know where it went. My care taker burnt the first snake immediately after killing and the same he did to the second one. Today he put 1 rupee coin in its mouth and burnt. I do not know why but looks like that is the tradition here to burn. What is the best way to keep snakes away? Anyone who can suggest some plant or any other way to keep snakes away from living area plots, that would help. 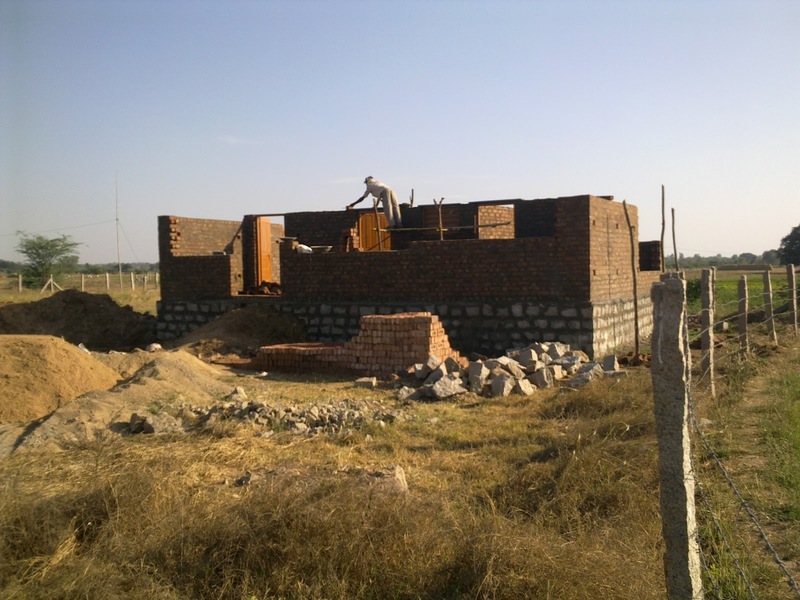 In this post, I would pen down my experience and lessons I have learned during farm house construction. I am still on the way so just posting the picture for now. Will keep updating this post so that one can get all info at one place. This house construction is not using pillars method of construction but old traditional method of foundation digging. 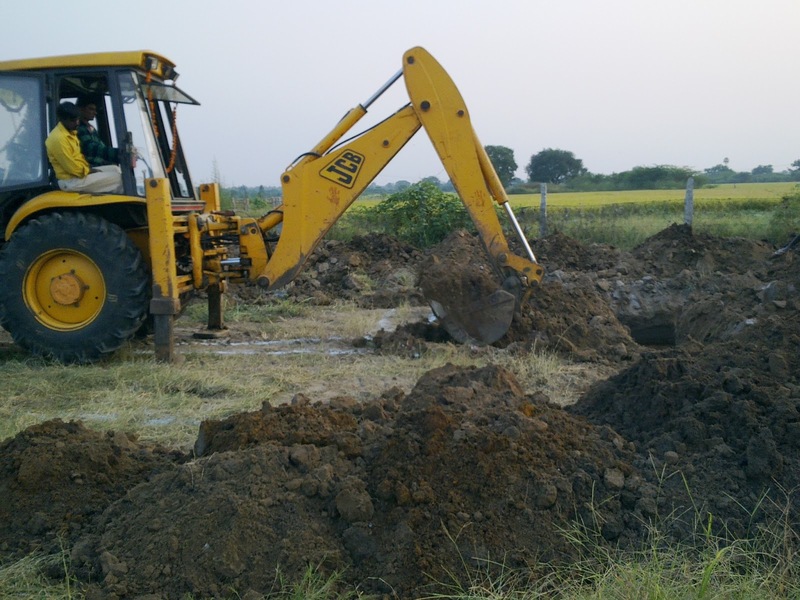 Despite that its little cheaper but I would recommend to do it manually through labor as labors digs exact width but JCB doesn't so you will end up consuming more materials. Even if JCB has done it you will need some amount of labor and manual work. So eventually, its the same cost as the labor cost. I have dug around 3 feet of foundation as after that I got morum (sandy soil). 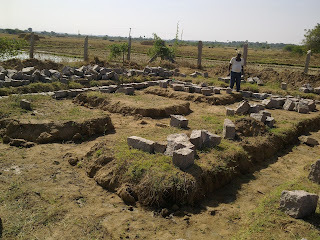 Once the foundation is filled with stone and mixed soil, let it dry for couple of days like above picture. Once the foundation has dried completely, start the foundation wall. In my case I have used Gannate (stone bricks with cement and sand). The wall width should ideally be 18 inches to make sure that it is well stabilized. Add sufficient amount of cement to the sand so that your Masala (mixure) looks blackish. Many also prefer to do this using soil and stone bricks but this is considered weaker. 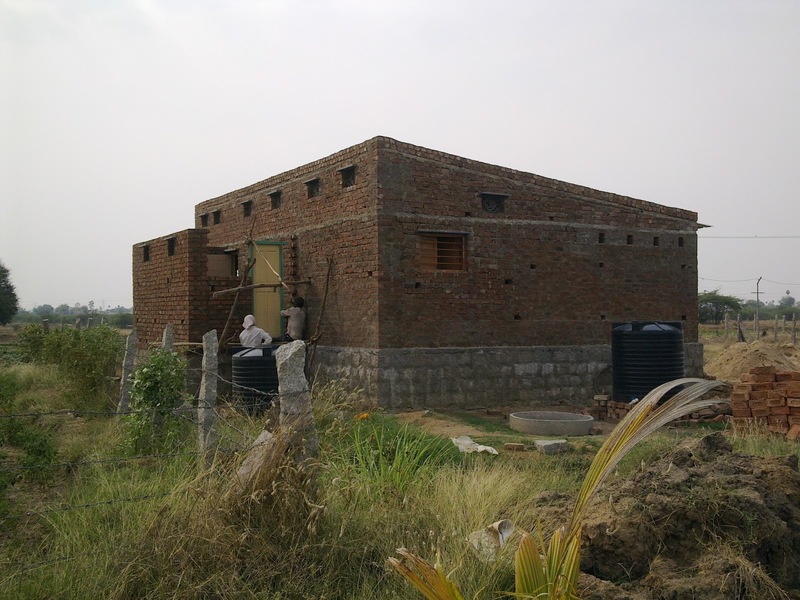 Once the foundation wall is complete (around 2-3 feet from ground or nearby road), have a layer of concrete and steel rod (plinth at the door) so that the moisture from the ground doesn't touch the wall and it also saves the wall from breaking and make the overall structure strong. I have kept 3 inches concrete and 3 pieces of 8 mm rod and crossed with 6 mm rod every 1 feet. I know this might not be a standard but I felt really hard to get proper stuffs to get ring and thicker concrete. Once all the wall construction is done, house is ready for door level band. Planning to go for 2 piece of 8 mm steel rod all around. After door level, the next step is to lay the wall to the roofing level. As I am going to use coated steel sheet so there is a sloping from back to front and the slope is 2.5 feet in 24 feet lengthy wall. The more sloping, the better it is. As my house is in the middle of the field so people suggested no to increase the height too much or the wind may create problem for the sheets, however my backside wall is around 10 feet and front side wall is 7.5 feet. Once the slope is perfect, put the sheet. 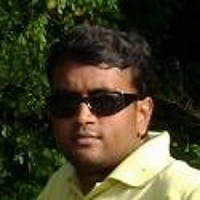 In my case I have used Coated sheet that is generally used in Industries. Its of white color so that less heat passes through and coated so less chances of rust. As my house is in the field, no houses are nearby so I have fixed so many J hooks with the pipe over wall and sheets. Still I feel that is not enough as in a little wind, one sheet went off. So I need to put more J hooks and put some more bricks over the top. Below is the view from the backside. After wall work is done and coated steel sheet is in place, the plastering work started and here is how it looks. This is simple three bed room, one hall, two bath room house. No fancy, just simple to live in. 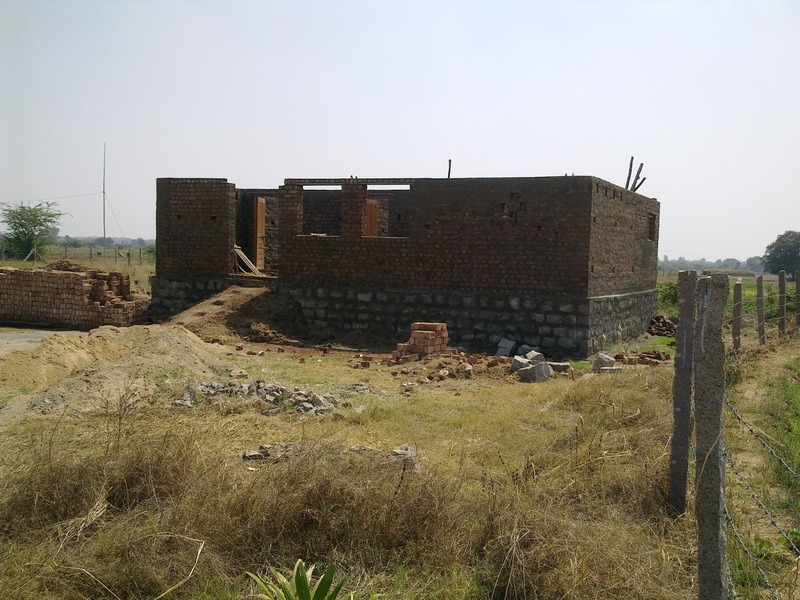 There is a lot of hard lesson I learnt during the construction of the house; lesson from Mason, Labors, Material suppliers, Villagers etc. Now I know why people are afraid of going to the village again from the cities; why villagers want to come to the city; why rich do not help poor; why people do not help each other; why people are becoming reserve and not becoming social; why people mentality is limited to themselves or family members; why there is no takers of good people; why good people can be counted over fingers; why no one cares what, why and where our surroundings, environment are going; why no one cares whether certain activity will be good or bad for the others or society etc. The words like human values, ethics, trust, relationship will be only found in dictionary. There will not be any live example in the coming years perhaps. 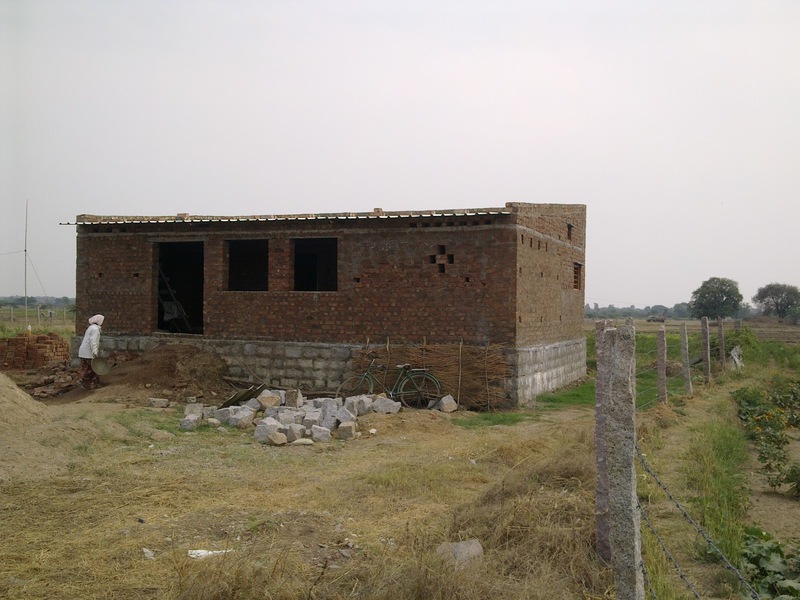 If anyone is going to construct a house in the farm, please contact me so that I can tell you my experience and you can avoid all the pain I have gone through. Sorry for delay in status update. Here is the current status. We are keep getting green vegetables from our farm and that is enough for the house consumption. We are getting wild pigs in our farm and that is causing damage to vegetable plants and Drum Sticks, not sure how to deal with it. 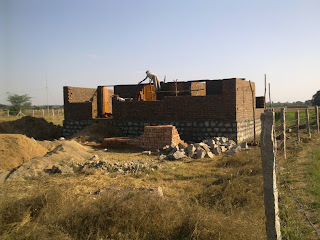 Below is the status of the house construction, we are complete till the plinth level (door level). Frustration, tension & jealousness and what not ? Thanks for your patience for the new post, I am keep getting emails and responses that what is happening in the farm, no status. Sorry for delay in this post. Here is the status. We are keep getting Palak (Spinach) regularly from our farm. Had restarted the house construction but because of conflict between my temporary care taker and mason, the work has stopped for time being. Its different and strange story, its village politics and jealousless. 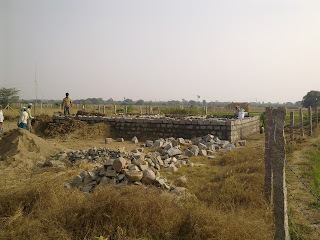 Long story short, I have spent around a lac of rupees till now in house construction and not even the plinth level is complete and the work has stopped. The drum stick plant that was growing very good has been plucked by someone few days back, I do not know why and who. This is also the result of jealousness. Same is the case of Lemon and other few plants. I do not know what they get by doing this. I have spent my precious time, hard earned money and do physical work to water them one by one and they simply pluck in few seconds and ran away. I am very disappointed. Coconuts and other plants are doing well. We are watering every 4 days. The temporary care taker charge INR 200 every day to water all the plants. The water we are getting currently is from the pond we had dug and a temporary bore well that gives some water (we fill into a very small pond). I feel these plants will survive but who knows someone can come and pluck these plants too. Sometimes, I feel very disappointed by seeing all the progress I have made in the farm in last couple of months. 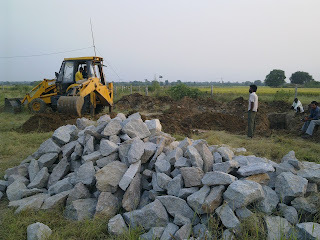 Recently I have also taken electricity connection for the bore well I had dug and here is the story about it http://farmingfunda.com/articles/1/how-to-take-electricity-connection-for-farming-in-andhra-pradesh. This was also a pain, after roaming several weeks to the engineers, line men, paying bribe, talking here and there looks like it has settled now but this was not less than a real frustration. The purpose of my farm is not to gain any commercial benefit but to spread greenery, create a model natural farm (that doesn't use chemicals and still grow stuffs) for others to follow and help villagers, provide employment to local people etc. but even to do all these good things, a lot of hurdles are created and I am facing them almost every day. 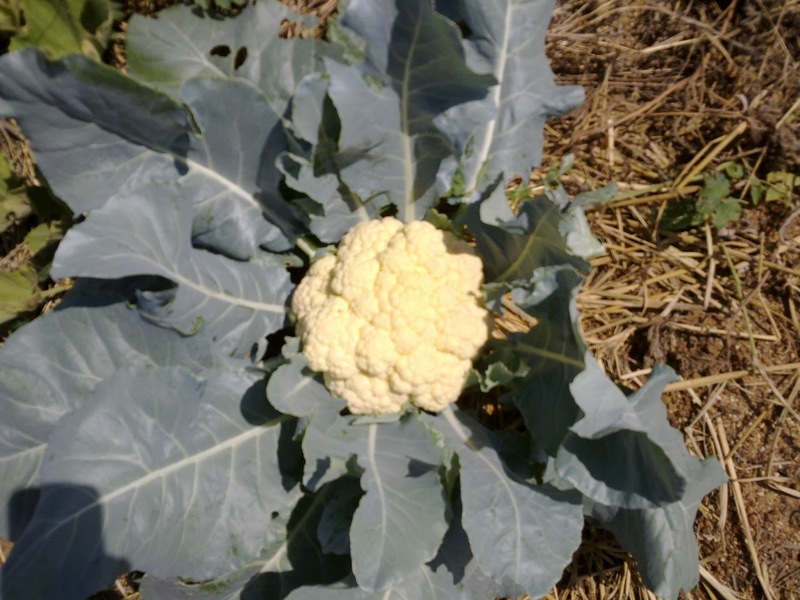 I know this post may discourage newbie who want to get into farming but I would suggest them not to get discouraged. Keep doing good things, one or the other day success will come. I am keep doing good things without any expectations from other side; this is the path I have followed since beginning of my life and will be on it always. Thanks for reading, keep suggesting your experiences that may help me to overcome all the issues I am facing.